​assassinations of Martin Luther KIng, Jr., and Senator Robert Kennedy. to full orchestra (3[1.2.3/pic] 3[1.2.Eh] 3[1.2.bcl] 3[1.2.cbn] — 4 3[1/flug] 3 1 — tmp+2 — str perc: bd, field dr, glock, xyl, vib). will find performances by orchestras of all types in 2018.
awarded a "Special Judge's Citation, Recognizing Unique Artistic Achievement"
by The 2012 American Prize in Composition: Orchestra Division (Professional). noting a concept (and its execution) of distinctive merit." 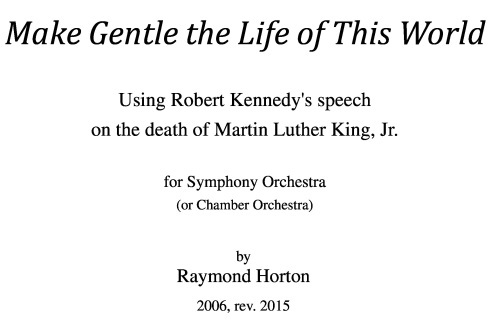 "The highlight of the season"
commemorating Bobby Kennedy and Martin Luther King. And as she told me the story I think her eyes got misty again." by members of the National Symphony and the Louisville Orchestra). Now in a new (2015) version with cues for Chamber Orchestra performance. instrumentation, duration, background on the work. Please contact us for any additional information needed. Audio (computer) demo Conductors (or other orchestral staff) please email us for a live recording. Conductors (or other orchestral staff) please email us for a complete perusal score. 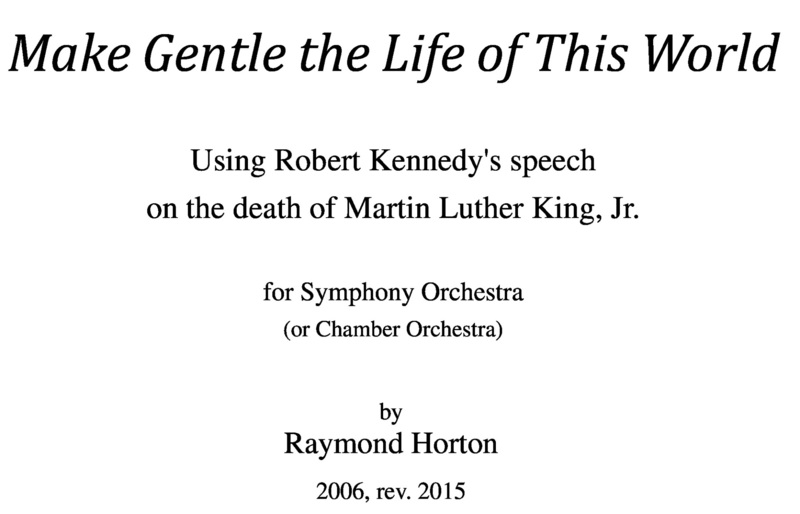 Large score (11 x 14) for "Make Gentle the Life of This World"
A new three movement, 14-minute work for orchestra based on early American shaped note tunes from Southern Harmony. American Shapes would be a challenge for a good high school orchestra, fun to play for pros or for a good community orchestra. Movement two features a nice sliding trombone solo and a fun timpani part. Awaiting premiere. Contact us for more information. Three movements for orchestra based on Appalachian songs, hymns and fiddle tunes. Playable by a good high school orchestra, enjoyable by any level through professional. Called "an evocative symphonic suite...at times tender, at times rousing" by Dudley Saunders of the Louisville Times. Score and parts in preparation. Contact us for more information. A 22-minute work for orchestra, two narrators and bass-baritone singer that quotes spirituals, hymns and pioneer songs as it tells the true story of a group of 107 freed slaves that settled in Southern Indiana in 1814 and the white couple that made that group’s freedom their life’s mission. Excellent for educational concerts. Playable by a community orchestra, easy for pros.